"Easy paneer recipe. Add to your favorite curry or dish. Great for vegetarians. Home made paneer is softer and lighter than the tofu consistency paneer you find in many Indian restaurants." Pour the gallon of milk into a large pot. Bring to a boil over medium heat. Watch carefully, as it will boil over almost as soon as it starts to boil. As the milk begins to boil, pour the buttermilk into the pot in a steady stream while stirring constantly. The milk will separate into curd and water. Place a cheesecloth into a colander, and pour the milk mixture through it. Reserve some of the liquid for later. Let the milk mixture sit in the colander for a couple of hours, or until it stops dripping. After the curds are strained and settled, transfer them to a food processor. Process until smooth. It should be able to form a ball if it is the right consistency. If it is too dry, add a little of the reserved liquid and process again. The consistency should be like a firm ricotta cheese. Turn the cheese out onto a clean surface, and knead until smooth. Form into a ball, and wrap in plastic. Refrigerate until needed. To cook the paneer, heat the oil in a large heavy skillet over medium-high heat. Cut the paneer into bite size pieces. Fry for about 1 minute, or until a very pale golden brown. Drain on paper towels. Add to your favorite curry or dish. See how to make authentic Indian creamed spinach. This recipe works out very well. You can also freeze the left over paneer for later use. 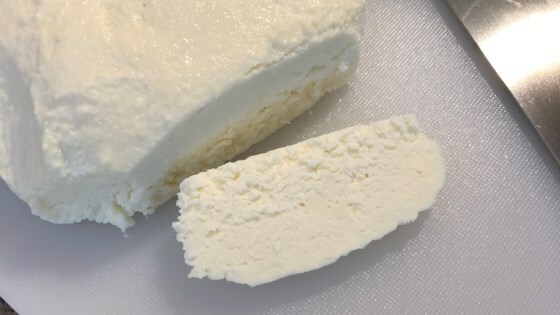 I absolutely love making paneer cheese. The buttermilk is a nice change. Try adding 2 cups of yogurt or a yogurt/lemon juice mixture to the gallon of milk for a different twist.